I was a few months into a fledgling effort known as EducationShift in 2014 when I decided it would be a good idea to publicly shame my dear friend and former teaching assistant Jason Shepard. He had been quoted in a story about the importance of Twitter in news, and I told the world he only had 59 followers. We used EdShift to cover why that was and how a more strategic approach could increase both his follower count and his impact on the social medium. Now that I am leaving my role as education curator for MediaShift, I look back at that story as symbolic of how EdShift has grown and the influence I hope it has had on journalism education. The brainchild of MediaShift Executive Editor Mark Glaser and Eric Newton at Knight Foundation, EdShift began with a grant from the Knight Foundation and a challenge to improve what many saw as the sorely lagging state of journalism education. The #EdShift chat has been one of our efforts to engage a vibrant community of practice. I was hired in late 2013 to accept that challenge and build a vision for EducationShift, which launched early the following year. I had a different take on the state of journalism education than many of its critics, who at times derided “lazy” or “disengaged” faculty who were too long out of newsrooms and badly out of touch with the digital realities of news in a new century. And thus was born the founding vision of EdShift: Build a community of practice linking these two groups and leveraging a powerful sharing economy for journalism education. An early conversation with Eric Newton — then at the Knight Foundation and now at Arizona State University — delivered a phrase that we used to operationalize that vision: solutions journalism. We set out to make EdShift a community where people helped each other solve problems. Ideas shared on EdShift have included plenty of novel assignment ideas, including this social media scavenger hunt. Take Jason. His problem was that he knew he needed to know more about and do more with social media. He knew it was important to his teaching, as well as his research. But he didn’t know where to start. 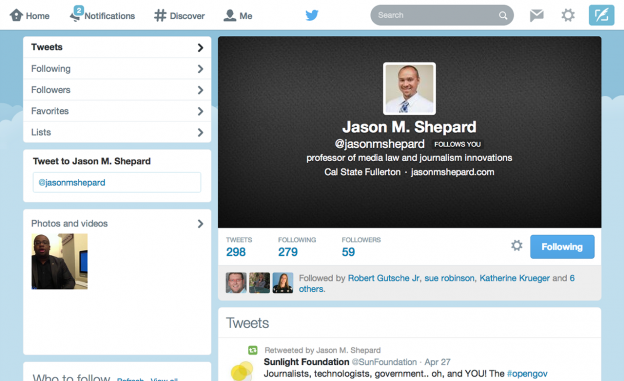 The EdShift story offered solutions, including targeted tweeting, building lists and following smartly. EdShift, thanks to the hundreds of people who wrote for it and all of you who interact with it, has been offering these solutions to educators for three strong years now, at times accounting for more than 40 percent of MediaShift’s traffic. No lazy or disengaged profs here. Instead, we see a committed and energetic community of teachers and researchers, gobbling up new ideas and trying them in their own classrooms. So it’s my pleasure as I depart from my leadership role to hand the keys to our brand new education editor, Aileen Gallagher from Syracuse University’s Newhouse School. Aileen has written terrific pieces for us already and has a true passion for what we do — our very best to try to move journalism education forward. I know she will continue to build the community of practice that has so inspired me throughout my time in this position. And she may have even more advice for Jason Shepard, though I am happy to report he is now at 973 followers, a 1,549 percent increase. Let’s all give him a hearty #EdShift follow and take him over the 1,000-follower mark. Kathleen Bartzen Culver is an assistant professor in the University of Wisconsin-Madison School of Journalism & Mass Communication and director of the Center for Journalism Ethics. Long interested in the implications of digital media on journalism and public interest communication, Culver focuses on the ethical dimensions of social tools, technological advances and networked information. She combines these interests with a background in law and free expression. She also serves as visiting faculty for the Poynter Institute for Media Studies and was the founding editor of MediaShift education section.